Im very excited to share with you my latest project Ive been working on. My husband and I wanted to make something special for my amazing in-laws this Christmas and we got the idea to design a five generations family tree. But not just any ordinary family tree, it had to be something unique and beautiful that they would want to put up on their walls for years to come. 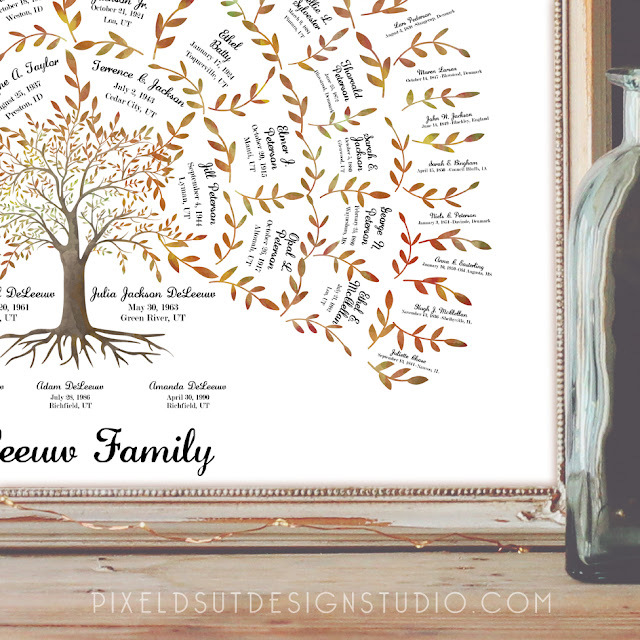 So over the course of a couple of weeks I set to designing my little heart out with this watercolor style family tree and all its thousands of leaves while my husband collected all the names, birthdates and birthplaces. It was really neat getting to work with my husband on something like this. We rarely get opportunities to work on design project together. We probably spent a good hour just looking at the print when the project was all finished and framed. It was so fun getting to read all the names, dates and birthplaces of our ancestors and getting to physically see where our "DeLeeuw" name came from. My husband turned to me and said now we have to make one for ourselves. I completely agree! 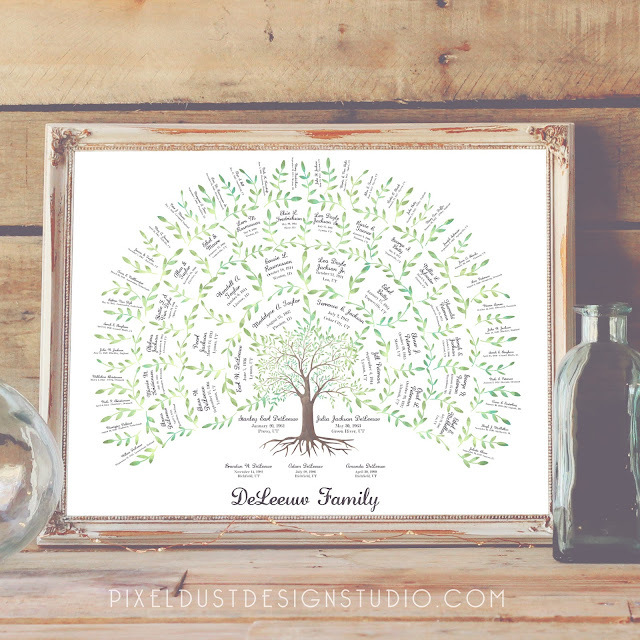 These Generation Tree prints also make great gifts especially for a bride and groom. 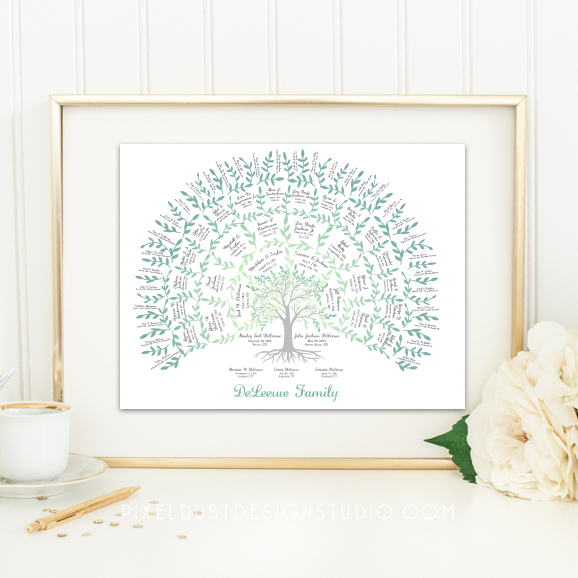 Make this print extra special and order this print in their wedding colors. 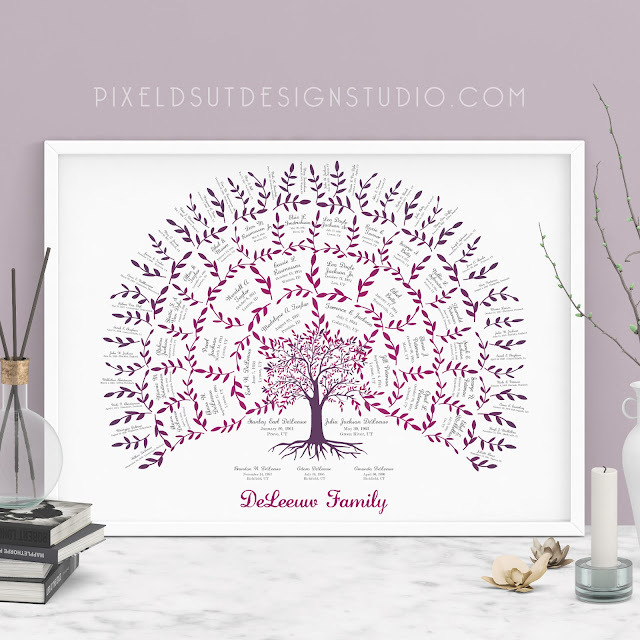 Or you could also order your family tree for extended members of your family so every one can have a print and then request to have each print designed in a different color scheme to match your siblings or children personality and/or style. Ordering is simple. Just purchase the design here on my shop and then message me your names, birthplaces, and birthdates in order starting from the top left. I will take it from there. I will input and arrange all your names and birth information and then edit and adjust the design according to the names. Then format and size the design to your needs. These are available in digital format only. You will receive two different files to use for all your printing needs and to be able to print at many times as you would like for yourself and your loved ones. Turn around time: two to four weeks. I love this idea and am so glad you are making it available for purchase. A family treasure, simply gorgeous! Thank you.